The Belize Tourism Board, on October 16th 2010, held its 9th annual Taste of Belize competition at the ITVET complex in Belize City. The event saw the participation of chefs, bartenders and cake decorators from across the country. 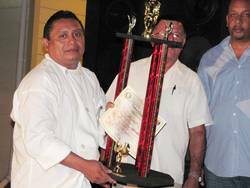 The taste of Belize was divided into three parts; the professional chef competition, which saw participants competing in 3 rounds, the bartending competition and a cake decoration competition; in addition to the three main competitions, restaurants and establishments from the various localities were invited to compete in the "Best of Belize" competition. This leg of the competition saw the participation of eight booths, including the participation of San Pedro's very own Elvis Kitchen. The professional chef category was opened to any individual that had worked as a chef for two years or more in the country of Belize. In this leg of the competition, contestants were provided mystery baskets containing secret ingredients, of which all must be used in the preparation of the dishes. Contestants were invited early in the morning to view all ingredients available for usage which was readily available at a prepared counter. Chefs were judged on: timing and work plan, use of ingredients and cost effectiveness, hygiene practice, knife skills and cooking techniques, taste, nutritional balance, presentation and eye appeal, Belizean or regional influence and originality of recipe. Dishes were judged on taste and presentation by a panel of culinary judges. At the end of all three rounds, Calbert Santiago of D Deck Restaurant came out the winner. 2nd place went to Jason De Campo of Global Spice and 3rd place went to Luis Cawich of The Villas at Banyan Bay/Rico's Bar & Grill. The bartending competition included three rounds; two elimination rounds and the final round. Competitors were provided with the names of the ingredients to be used prior to each round as well as instructions on preparation. Competitors were judged on taste, technique/skills, originality, presentation, showmanship and personality and punctuality. At the end of round one, six bartenders moved onto the second round. Round 2 of the bartending competition was the speed round, with the winner being the bartender with the lowest time average. Deductions were issued for the following: spills, breakage, portion, wrong/missing ingredients, wrong procedures and wrong garnish. Round three saw participants preparing two cocktails based on a mystery box of ingredients, prepared using different techniques, frozen, shaken, stirred, layered, etc. At the end of this competition, Bartender of the Year 2010 was named and the winners are as follows: 1st place, Kendra Timons of the Radisson Fort George, 2nd place, Marvin Argereth of the Riverside Tavern and 3rd place, Mariano Coc of the San Ignacio Hotel. The cake decorating contest was opened to all participants that were not a professional pastry chef. Under the theme, "I Am Belize", participants were expected to create a cake depicting a unique Belizean concept. Cakes for this competition were brought to the competition, where they were assembled and decorated. Contestants for this competition were judged on their skills and techniques, hygienic standards and relevance to the theme. Cakes were judged on presentation and relevance to theme and production methods. The time frame foe the competition was 2.5 hours. The winners of the cake decoration competition are as follows: 1st place, Tamara Tingling, while Diane Galvez took 2nd place and Sharon McKay of Nazarene High School took 3rd place. Best of Belize was more like a catering competition and was opened to teams from the various destination across Belize. Teams were made up of two or more members. The various teams were asked to create dishes that reflect their local flavor and uniquely identify their various localities. Best of Belize destination locations are as follows: 1st place went to Orange Walk, 2nd went to Dangriga and 3rd place went to Hopkins. The crowd was allowed to vote in this competition and the crowd favorite went to Cayo. Entertainment for the night was provided by Harrison King and the Doggie Band and Youth Connection Band. On hand to issue awards and trophies was the Minister of Tourism, Civil Aviation and Culture, Hon. Manuel Heredia Jr.